For more than a half-century, Indonesia’s government-backed economic development has been based on exploiting and exporting the vast natural resource wealth in its waters and forests— often to the detriment of indigenous people who historically occupied these areas. This exploitation has also gone against the customary laws of those indigenous people. While activists, politicians, media and government officials, including Indonesia’s president, have made progress on indigenous communities’ land rights, there is still a long battle ahead to restore customary forest governance amid a contradictory and convoluted policy landscape. A 2013 legal opinion from Indonesia’s Constitutional Court opened the door for indigenous communities to reclaim customary lands. Evidence from Indonesia and the rest of the world suggests this would benefit forests and the climate: forests held by indigenous communities see less deforestation. In Indonesia, where the national climate commitment under the Paris Agreement hinges on keeping forests intact, indigenous communities could be the key to climate action. The concept of adat has been a theme in state-society relations since the Dutch colonial era in Indonesia. Originally an Arabic term, adat translates to “custom.” In terms of land and resource management, adat refers to the rules that determine who may utilize local territories or resources, and how. The Indonesian Constitution only weakly recognizes such rights. Instead, most of the country is classified as State Forest Area, where the central government has the authority to allocate the function, meaning and utilization of forest lands and resources. It subsequently undermined pre-existing adat rights and management systems, and dispossessed many customary communities from the lands and resources they depend on. The landmark 2013 court decision found that customary communities’ forest lands, normally known as hutanadat, should not be classified as State Forest Areas. This judgment could pave the way for a major reallocation of forest back to the communities that have long occupied and looked after them. “We have lived in this forest since before this nation was established. I only knew that I lived in a conservation area when some forest rangers came to our village and told us how to run our lives!” said Pak Ilyas, 64, one of the elders in Gajah Bertalut. The settlement sits on the bank of the Subayang River, where there is still a relatively pristine rainforest. The forest is also the habitat for a variety of endangered species, such as the Sumatran tiger, sun bear and tapir. According to the local folklore, the ancestors of Gajah Bertalut’s residents originally came from West Sumatra. As an indigenous community, Gajah Bertalut is headed by a tribal chief called Mamak Suku, who establish Nini Mamak, an adat council that governs the community and establishes the adat rules. These rules can include determining a time when communities can fish in designated areas of Lubuk Larangan (literally “forbidden river”) to prevent overfishing, preserve the river ecosystem and ensure the sustainability of fish populations as well as protecting forests with rules on forest product cultivation. 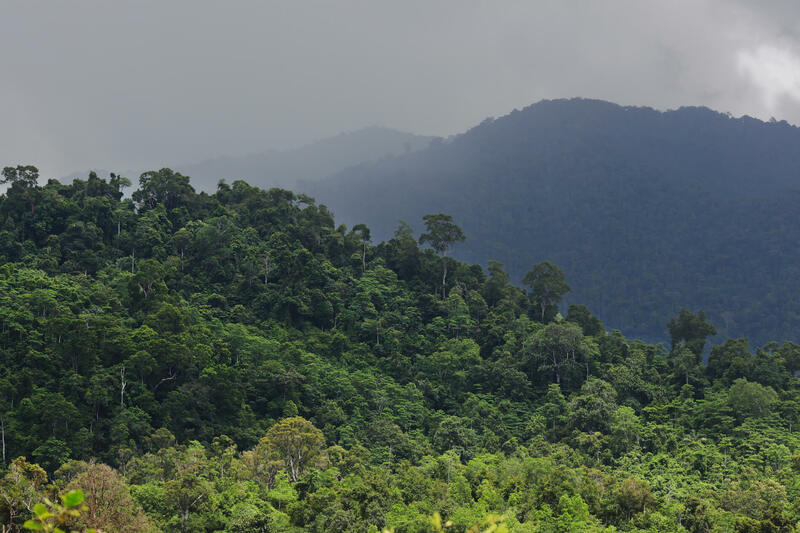 Gajah Bertalut’s customary forest areas are located inside Bukit Rimbang and Bukit Baling Wildlife Reserve (Kampar district, Riau province), an area of approximately 141,000 hectares (350,000 acres). In 1982, the state expropriated Gajah Bertalut’s customary forest areas for a wildlife reserve. Based on our analysis using Global Forest Watch, the Rimbang Baling area experienced forest cover loss of around 3.54 percent from 2000-2015, more than triple the percentage in Gajah Bertalut’s forest territories over the same period. This result echoes findings from several other studies that have confirmed better use of natural resources when forests are managed by indigenous communities. Supporting legal recognition of the Gajah Bertalut communities requires production of participatory maps that adhere to the government’s standard – and this is where One Map Initiative plays a part. A team comprised of the government of Kampar district, AMAN Kampar (a local alliance of customary people) and WRI Indonesia supported the communities in collaboratively mapping the villages’ boundaries to include updated and accurate geospatial information and in developing villages’ spatial planning that can be acknowledged by the national government. For Gajah Bertalut, gaining legal recognition of land rights would clarify and elevate their legal standing in claiming their rights to resources, providing a mandate for adat institutions in managing many aspects of people’s lives, including access and control of forest resources.